What's in Fortnite's mysterious purple cube? What's in the box? PC Gamer's editors take some not-so-serious guesses. 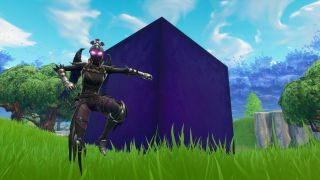 Unless you've been living under a cube, you'd know a massive purple cube appeared in Fortnite last week. Summoned by a lightning storm from a quickly closing time portal, the cube, its contents, and its final destination as it lazily flips about the map are unknown. All we can surmise is that it's part of the build towards Fortnite Season 6, likely the catalyst for some major map changes and new item introductions. But it's not every day that a massive cube plops down in the most popular game out there. We at PC Gamer have our own ideas about what we'll find inside. The obvious and indeed only answer is that the box will spring open to reveal another box. More specifically, that new box will be the sequel to 22Cans' zeitgeist-groping cube game. We will collectively behold the majesty that is Curiosity 2: Curiouser and Curioser and know that finally, with complete certitude, Peter Molyneux was right along. That if anything, he has over-delivered on his promises. The cube represents manifest destiny, marching ever onward. And when it breaks open, you know there's only one thing that could to be inside: a cowboy. The medium of the cube contains yet more mediums, extensions of our senses repackaged and alienated from our bodies and natural processes. We desire the cube because we desire to be whole again, to be ourselves. It contains everything and nothing, meaning it is the ultimate fulfillment of our dreams until cracked open. We constantly ask developers to add this and that to games so we get a better time-to-money ratio as if the experience and wholeness the cube provides isn't already free and isn't invaluable. It doesn't matter what we're doing, so long as it is new and is capable of occupying time and attention. Who needs new maps, new items? Story? Pff. The cube is the perfect distillation of videogame content. It is massive, confusing, and featureless. It will roll around forever. It will never open. And soon we will die. Well, I was a big fan of Wheel of Fish, so I know what's in the box. Clearly, the only thing that could be in the box is another session of this mortifying panel from BlizzCon 2017, where a group of panelists have to guess what's inside a giant Overwatch loot box, except the giant loot box that was supposed to be on stage got stuck in customs, so instead they have to speculate about the contents of a much less impressive normal-sized loot box. This went on for almost 40 minutes. I'm convinced this is all an elaborate callback to the 2008 Unreal engine tech demo that starred a grotesque cube of wobbly meat. When Fortnite cube gets closer to its destination, the purple exterior will peel away like the wax from a Babybel cheese slice, and the interior will be full of glistening offal. The reward will be the sound of a vast host of Twitch streamers vomiting all over their mic setups as Tim Sweeney laughs maniacally into the void. It's Snake, right? Similar to 'What was that noise?' and 'Whose footprints are these? ', the answer to 'What's in the box' is always Snake. What a crossover that'd be. It's interesting to note the cube moves in a similar manner to the cube of Kado: The Right Answer. Which suggests that—whatever is actually in there—after weeks of mystery and drama, it will ultimately devolve into meaningless nonsense and disappointment. The cube contains a copy of Fortnite's map on which another match is being played. Were you to look inside, you'd see tiny players observing their own cube, which contains yet another Fortnite match, and so on recursively forever. If you were to leave the boundaries of your own match, you'd exit a cube and see giant players going about a game of Fortnite on a larger map than your own. If you exited again, and again, eventually you'd be so small as to be imperceptible to the giant players, smaller than a pixel, and you'd see only pulsing colors and the swirling debris on the surfaces of your eyes. And then a door. And inside the door, Tim Sweeney, sitting patiently, waiting. Go to him now.